This species is accepted, and its native range is S. Pen Thailand to Peninsula Malaysia. S. Peninsular Thailand, Peninsular Malaysia (Type). Semi-erect to decumbent, evergreen herb to ca 75 cm tall. Stem creeping to decumbent, somewhat elongate. 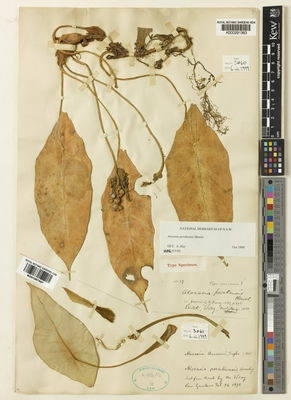 Leaves several along the stem, irregularly interspersed with lanceolate cataphylls to 8 cm long, drying red-brown; petiole to ca 40 cm long, sheathing in the lower 1/3, grey-green to purple-brown; leaf blade ovate to elliptic, peltate, coriaceous to thickly coriaceous and subsucculent, dark green to grey-green, apex broadly acute, acuminate for ca 1.5 cm, the margin mostly entire, occasionally somewhat sinuous in the lower part; primary lateral veins 2–3(–4) on each side of anterior costa, running to a submarginal vein ca 1 mm from the margin; secondary venation not forming interprimary collective veins, mostly inconspicuous but, like primary venation, adaxially impressed in dry state in thickly coriaceous leaves, posterior lobes completely united except for a shallow retuse notch, rarely with an acute notch to ca 1 cm deep. Inflorescence solitary to paired; peduncle about half to subequalling the length of the petiole; spathe ca 6 cm long; lower spathe ovoid, ca 3 cm long; spathe limb narrowly ovate, ca 3 cm long, at first erect, then reflexed, greenish white; spadix shorter than spathe, ca 5 cm long, stipitate for 4 mm; pistillate flower zone ca 7 mm long; ovaries globose, ca 2.5 mm diam. ; style 1.5 mm long; stigma prominently 2–3-lobed; sterile interstice ca 2.5 mm long, a single whorl of synandrodia; staminate flower zone 1.5 cm long, entirely within the lower spathe chamber, conical, ca 8 mm diam. at base narrowing to 5 mm at apex corresponding with spathe constriction; synandria 3–5–merous, ca 4 mm diam., more or less hexagonal; appendix narrowly cylindrical, ca 2.5 cm long, 4 mm diam., deeply grooved, white to yellowish. Fruiting spathe ovoid, ca 4 cm long; fruit an ellipsoid berry ca 1 × 0.4 cm, ripening bright red. In montane forests, in leaf litter and on rocks, 1100–1525 m asl.